RV Weather conditions are critical. When you live in a stick and brick house, you've already learned what the weather will be for each time of year. It may vary a little, but not too much. As an RV'er, traveling throughout the US, there are certain areas that should be avoided at certain times of the year! Unless you are an avid weather person (or historian), you can get caught driving into a tornado, flood or snowstorm before you know it. Being aware of RV Weather will help avoid having to deal with weather watches and weather alerts. Most RV'ers just look at a map, say yes to going somewhere and off they go! Opps - what about the weather conditions!?!? Many of us forget to research the weather of an area first, before just driving into it. Information technology is so much better today, but we need to protect ourselves, family and the RV itself; if we want to have a long successful time out as an RV'er!! We found this brand of radio (Midland All Hazards Weather Alert WR-300) to be hopefully the best. We looked at the handcrank ones as well, just in case we really lose power. However, we couldn't find any that really would last. Most are plastic with the hand crank handles breaking off or lasting only a few minutes when cranked. Cute, but don't really cut it. We wanted a radio that could be tuned to local area NWS Weather stations, give advisories and warnings as well as an "alert" to conditions that would directly effect us! This Midland can be set up to receive from different local weather stations. It seems to be very thorough, yet not too expensive. It really doesn't matter what you have or listen to - just that you do! Imagine driving into a flood or tornado with no warning!! Just seeing a tornado would be enough for me. At least this way, we stand a reasonable chance to avoid one before it is too late. I know many of us rely on TV news as well as the internet. However, sometimes reception just isn't that good for it or you really can't or shouldn't be driving with your TV on. 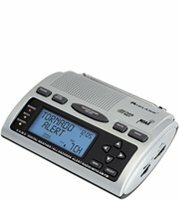 This Midland radio gives you the safety of advisories and alerts, as needed. You can put it on your Smartphone and receive incredibly great RV Weather info, radar, alerts and warnings!